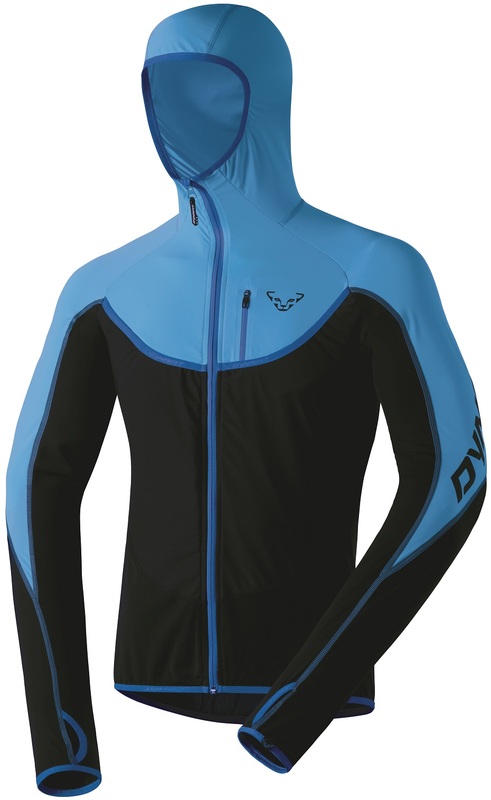 We’re not sure whether Dynafit named this jacket after the ski or the race. It seems to be suited for either. Speaking of being suited, wearing the PDG Jacket will have you half way to being fully suited. With the stretch pockets in front for stashing your skins and a stretchy feel throughout, it’s not a stretch to say the jacket is suited for speed. Also, it has a hood, so that’s cool. Polarite Dynastrech material is 84% nylon and 16% elastane offering comfortable protection. Large chest pockets let you stow your skins for the descent without removing your pack. Soft feel on the interior stems from 80% polyester and 20% elastane, i.e. stretchy fleece. Additional zippered check pocket is good for gels and other nebulous items. Option to match with the PDG PL U PNT, which is Dynafit speak for hot pants. Tight fitting hood, thumb holes, and a reflector stripe round out the bullet points. I have one of the very early versions of this jacket, maybe 2010. It is the most used piece of touring or race gear I own. It's always in my Spring ski kit and normally my outer layer for 20-50-degree F days. For races--I'm a slower old guy who doesn't generate the same heat at the front of the pack--I often wear it over my race suit when the temps are single digits and lower or when exceptionally windy (like the 2018 Breck 5-Peaks and the 2018 Powderkeg). The skin pockets easily accommodate and securely hold 100mm wide skins. The hood is bomber, easily obviates need for headband or cap, except for lack of a bill to block sun. It wicks very well and doesn't stink near as much as other synthetics. It was my daily layer on the Haute Route and lesser traverses, never once wrinkled my nose before donning in the morning! I expect that in about 8 years I've used this jacket at least 25 days per year. It has minor holes in the skin pouches. Sun-fading is the most obvious wear and reason for replacing. I am ordering a replacement today, and will choose the similar DyNA jacket simply because of color/size availability. While I do like all the functionality of this jacket (which I would rate as 5) I have tough time to keeping it from sliding up my back for whatever reason (would rate it as 3). Maybe sizing up would solve that issue but then the sleeves would be too long perhaps. I recommend it but perhaps try it out to make sure the fit is right for you. I'm looking at both this (Dynafit PDG Jacket) and the Dynafit Mezzalama Jacket. - Does it make sense to use both? I'm picturing using the PDG as a substitute for my Patagonia R1 (with a lightweight baselayer under it), and the Mezzalama on top of that when it's cold. - I'm 5'6", 135 lbs, and it looks like all my measurements fall into the XS category. So I was thinking, XS for the PDG, S for the Mezzalama (since it isn't offered in XS, also easier to layer if it is bigger). That sound about right? - Ditto for the PDG pants. Looks like XS is the way to go... I typically wear 28" waist pants, either in S or XS. XS sound right for pants? Also, Happy New Year to whoever gets to answer this. -Makes perfect sense actually! I use a very similar jacket, the Millet Pierra Menta Hoodie underneath a Mezzalama and there are very few conditions where that layering system isn't appropriate, so I think you're on the right track. Both are awesome jackets. -I think you nailed it with the sizing. We are similar in dimensions and that's exactly what I wear. Our entire staff is outfitted with the Mezzalama jacket and unless it's July they seem to always be in the pack. -XS absolutely. Our waist sizes are identical and the XS is spot on. So far that's my favorite pant! Super versatile and has singlehandedly replaced a handful of other pants. It's breathable enough to do some casual racing or high output days in and not overheat, but still warm enough for a lower intensity mid-winter tour when paired with a warm baselayer. One of my favorite layers for skiing. In cold temps, the hood and thumb loops are a life saver, and the skin pockets fit even mid-width skins well. I have the older version with a back pocket, which is great for a bottler or wind shell. Race suit is almost out due to this piece, as it is so flexible. Overall: Five Stars for a versatile alternative to a full one-piece lycra suit for racing or to a soft shell for touring. Pocket assortment is basic, but bonus points for the hood and full-zip open ventilation (plus perhaps the thumb holes). Background on product familiarity: I own the 2014-15 version but haven’t used it yet. By comparison, I’ve used the La Sportiva Syborg race top, as well as recent race suit models from Crazy Idea, Dynafit (whose Radical suit is very different from the PDG top), Soul Limit (Team Hagan version), and Texnar (hand-me-down USSMA suit). First, the first impressions out of the box: The fit matches up well with the sizing chart, although note that continental differentiation, e.g., I’m a Medium among Europeans but a Small among my fellow Americans. The thumb holes are new for me, and I’m not sure whether I like them in general, but they do help avoid any exposed wrist skin in cold temps. Also for cold temps, the hood helps seal you up against heat loss from the neck and head. For warm temps, lots of mesh on the back and a full-zip opening in front. The full-zip opening in front though means no accordion-style inner pockets for climbing skins, and also less material to block the wind. But the two large outer pockets are still fine for skins, with a simple yet effective elastic closure. Also on the outside is a small zippered pocket. On the inside is a typical flap-closure pocket for ISMF 5.1.16 beacon compliance (or valuables of a financial nature). Second impressions, in use: My favorite setup would be a conceptual combination of features from Crazy Idea, Dynafit, La Sportiva, Soul Limit, and Texner. Absent that, the PDG features should work reasonably well for me, while wearing a separate jacket/top and pants/tights allows for more versatility in the field and a somewhat closer resemblance to a respectable member of society once off snow. Third impressions, for long-term durability: Seems nicely made overall, with the usual caveat though about lycra’s long-term durability. What is 4 + 15?